The p65; RELA antibody from Proteintech is a rabbit polyclonal antibody to a recombinant protein of human p65; RELA. This antibody recognizes human,mouse,rat, pig antigen. 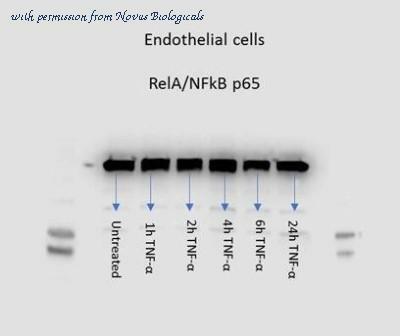 The p65; RELA antibody has been validated for the following applications: ELISA, IP, WB, FC, IF, IHC analysis. 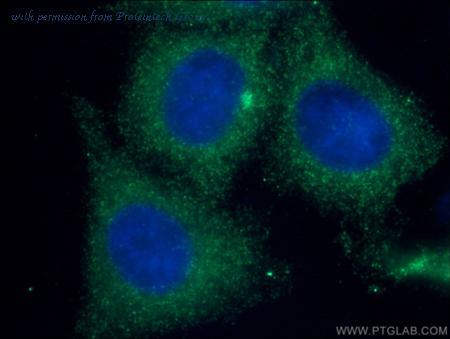 Immunofluorescent analysis of NFkappaB/p65 (green) in HeLa cells either left untreated (left panel) or treated with 25ng/ml of TNF-alpha (right panel) for 25 minutes. Formalin fixed cells were permeabilized with 0.1% Triton X-100 in TBS for 10 minutes at room temperature and blocked with 1% Blocker BSA (Product # 37525) for 15 minutes at room temperature. 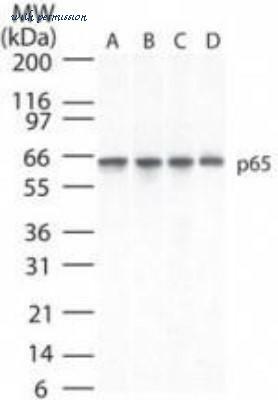 Cells were probed with a NFkappaB/p65 polyclonal antibody (Product # PA5-16545) at a dilution of 1:50 for at least 1 hour at room temperature, washed with PBS, and incubated with DyLight 488 goat anti-rabbit IgG secondary antibody (Product # 35552) at a dilution of 1:400 for 30 minutes at room temperature. F-Actin (red) was stained with DyLight 554 Phalloidin (Product # 21834) and nuclei (blue) were stained with Hoechst 33342 dye (Product # 62249). Images were taken on a Thermo Scientific ArrayScan or ToxInsight Instrument at 20X magnification. Formalin-fixed, paraffin-embedded human placenta stained with NFK/P65 antibody using peroxidase-conjugate and AEC chromogen. Note cytoplasmic staining of trophoblasts,fibroblasts and endothelial cells. A549 cells were lysed 72 hours after transfection. Cells were transfected with Transfection Reagent alone (Lane 1), 100nM ON-TARGETplus siCONTROL Non-Targeting Pool (Lane 2), or 100nM ON-TARGETplus RELA siRNA (Lane 3). Western blot data for GAPDH is included as a control for equal protein loading. Flow Cytometry: RelA/NFkB p65 Antibody (112A1021) [NB100-56712] - Intracellular staining of 293 HEK cells using 0.5 ug of p65 antibody. Green histogram represents the isotype control (p65) antibody. 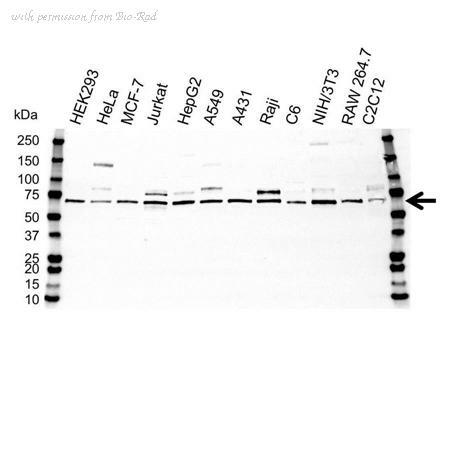 This NFkB p65 antibody was used for this test with an anti-mouse IgG PE conjugated secondary antibody. 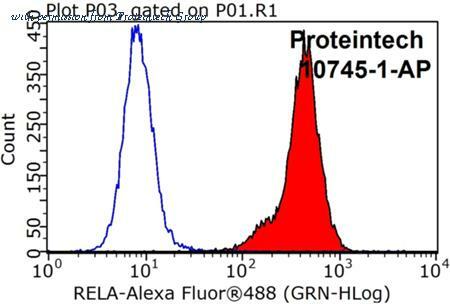 Simple Western: RelA/NFkB p65 Antibody (112A1021) [NB100-56712] - Analysis using Azide Free version of NB100-56712. 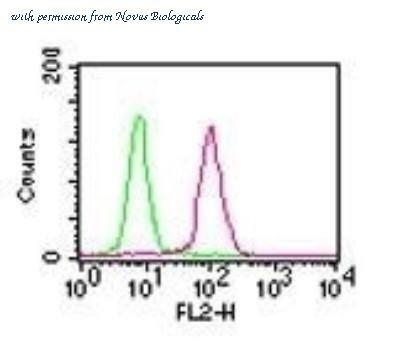 Simple Western lane view shows a specific band for NFkB p65 in 1.0 mg/ml of HeLa lysate. This experiment was performed under reducing conditions using the 12-230 kDa separation system. Flow Cytometry: RelA/NFkB p65 Antibody (112A1021) - Azide Free [NBP2-27416] - Simple Western lane view shows a specific band for NFkB p65 in 1.0 mg/ml of HeLa lysate. This experiment was performed under reducing conditions using the 12-230 kDa separation system. Immunohistochemistry-Paraffin: RelA/NFkB p65 Antibody (112A1021) - Azide Free [NBP2-27416] - Formalin-fixed, paraffin-embedded ovarian cystadenocarcinoma probed with p65 antibody at 5 ug/ml. Human tissue TMA was used for this test. 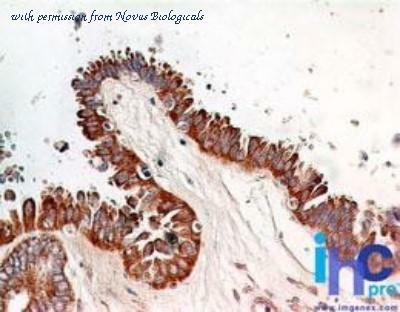 Staining of formalin-fixed tissues is enhanced by boiling tissue sections in 10 mM sodium citrate buffer, pH 6.0 for 10-20 min followed by cooling at RT for 20 min. 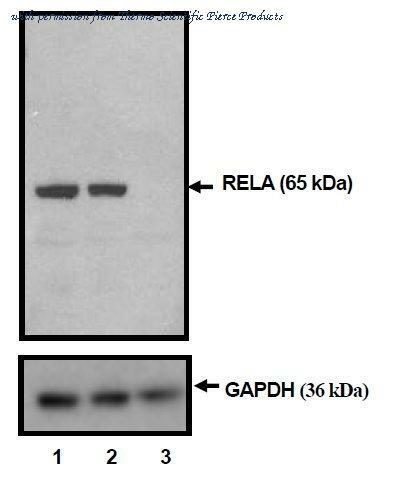 Western Blot: RelA/NFkB p65 Antibody (112A1021) - Azide Free [NBP2-27416] - analysis of p65 using p65 antibody at 2 ug/ml in 30 ug of A) Ramos, B) Daudi, C) HeLa and D) mouse NIH 3T3 cell lysate. 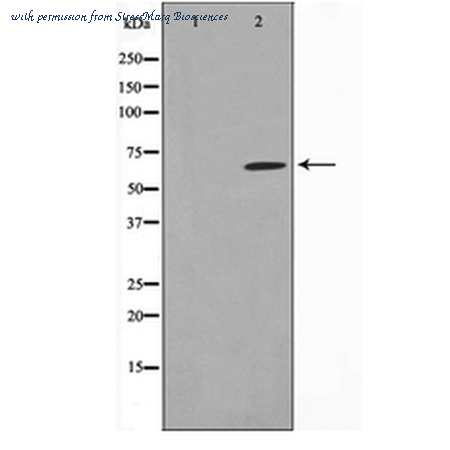 Western Blot: RelA/NFkB p65 Antibody [NB100-2176] - Analysis of NFkB p65 expression in A431 (A) and HeLa (B) whole cell lysates. Immunohistochemistry-Paraffin: RelA/NFkB p65 Antibody [NB100-2176] - Staining of formalin-fixed, paraffin-embedded human DLBCL showing nuclear expression of NFkB p65 in the tumor cells. Published customer image: . 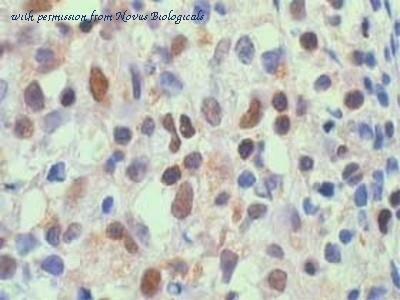 Rabbit anti NF Bp65 antibody used for the evaluation of NFκb expression in muring kidney by immunofluorescence. Image caption: . Response of vascular endothelial cells in human kidney in organ culture to TL1A. 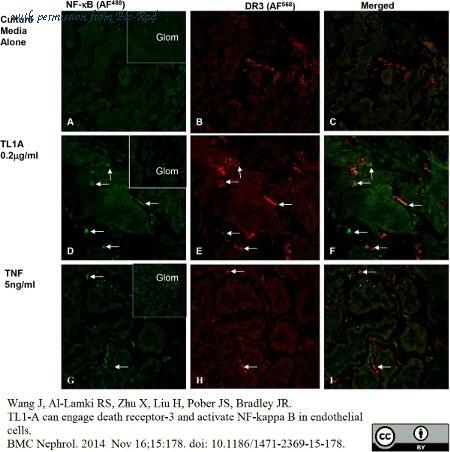 Confocal images of kidney organ culture incubated with either culture media alone or with TL1A (0.2 μg/ml) or TNF (5 ng/ml) for 3 hours at 37°C. (A-C) cultures incubated in media alone show EC staining for NF- Bp65 (green) in both the glomerular (inset) and in peritubular vassels. Some peritubular vessels EC showed positive staining for DR3 (red). (D-F) Cultures treated with TL1A show co-staining for NF- Bp65 (green) and DR3 (red) in EC of some blood vessel (arrows). Inset; show no signal for NF- Bp65 on glomerular EC. (G-I) In contrast, TNF-treated cultures show a strong signal for NF- B p65 (green) in EC of glomerular (inset) and peritubular blood vessels. DR3 (red) is present only in EC of peritubular blood vessels negative for NF- B p65. (Original Mags; x40). From: Wang J, Al-Lamki RS, Zhu X, Liu H, Pober JS, Bradley JR. TL1-A can engage death receptor-3 and activate NF-kappa B in endothelial cells. BMC Nephrol. 2014 Nov 16;15:178 . Western Blot of Rabbit anti-NFkB p65 (Rel A) antibody. Lane 1: HeLa cell extract. Lane 2: HeLa cell extract. Load: 35 µg per lane. 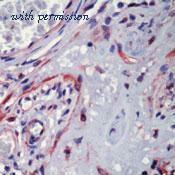 Primary antibody: NFkB p65 Rel A antibody at 1:5000 for 2 H at RT. Secondary antibody: Peroxidase rabbit secondary antibody at 1:2000 for 60 min at RT. Block: 5% BLOTTO 2 H at RT. Predicted/Observed size: ~65 kDa, ~65 kDa for NFkb p65 Rel A. Other band(s): None. Western blot analysis of Human Cervical cancer cell line (HeLa) lysate showing detection of ~65kDa NFkB p65 protein using Rabbit Anti-NFkB p65 Polyclonal Antibody (SPC-1279). Lane 1: Human HeLa treated with the immunizing peptide. Lane 2: Human HeLa. 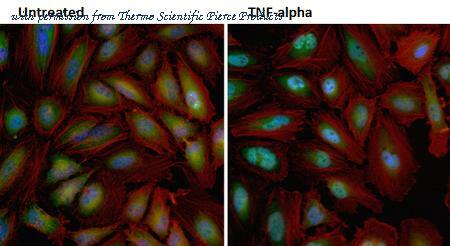 Primary Antibody: Rabbit Anti-NFkB p65 Polyclonal Antibody (SPC-1279) at 1:1000. Predicted/Observed Size: ~65kDa.